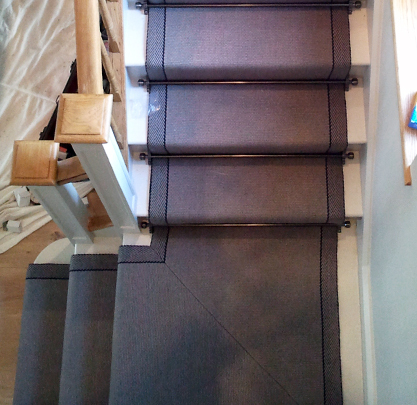 Project: Elephant grey bordered Roger Oates stair runner, fitted into a modern house in Somerset. The brief: For a simple, but stylish stair runner which provided continuity of flow around the small quarter-landing and on up the staircase. Read on to find out more about the installation and what the customers thought. The installation shows the HAND-SEWN mitre, completed by Roger Oates Carpets, and measured / templated by Arditti Carpets' experienced estimator. 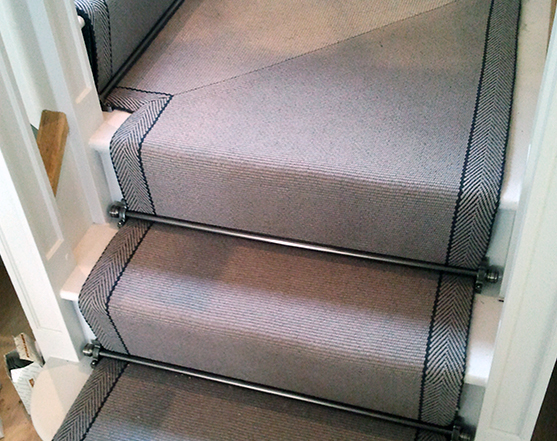 Looking to purchase a Roger Oates stair carpet for your home? Give us a call and see how we can help today.